All content © Jennifer Weide. My original artwork is shared for personal inspiration only and is not to be submitted for contests or publication. Thank you! SUDSOL Summer Mini Blog Tour!! Here is the second graduation card, done in Crete High School colors. This is very similar to the Pacific & Black one I shared yesterday. I changed it up just a bit. 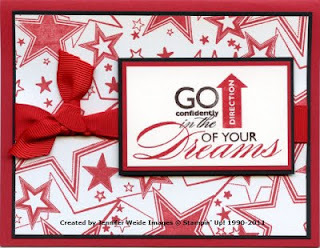 Card base is Real Red with a Basic Black accent layer behind a Whisper White background. The background was wheeled with the Classic Stars jumbo wheel in Real Red. I've discovered lately I like the tight accent layer, leaving a larger area of the card base showing. I get that by cutting the accent layer 1/8" bigger than the background, instead of 1/4". On the "dreams" saying on this one I used markers to get both Basic Black & Real Red color. It's layered on Real Red & Basic Black and attached over Real Red Grosgrain ribbon with dimensionals. Agan, quick and easy!! Click HERE to Shop My Store NOW! !